Tom Ford Lips and Boys. Back again and this time permanent. When they first launched in 2014 I bought 7 and you can read reviews and swatches here and here. Giacomo is still one of my most used lipsticks if I want a pink lip pick me up. Now there are 25 more boys in the team and I splurged on 5 more when I was in the UK over Xmas-and I am so glad I did because I am absolutely smitten with them all. The concept is simple-50 miniature lipsticks named after significant and influential males in Tom Fords life-I am sure there is a story behind every single one of the names and plenty of people have hazarded a guess about which lipstick belongs to which male but Tom Ford appears to be remaining tight lipped. This time, Luciano, Drake, Kingston, Theo and Jake made the cut. I had a couple more on my wishlist but the swatches in real life weren't as I had hoped. These 5 though are all stunners-and I am pleased I got my hands on the much coverted Drake (enabled by Tasha) even if it does slightly remind me of a colour my nan used to wear from Avon called Amethyst Shimmer. I'm totally down with that. All the colours are luminous and have a satin finish. They don't move around the lips but I do pair them with a liner for additional staying power. I'm a big fan of Tom Ford lipsticks and if I could only ever wear one brand for the rest of my life on my lips I have decided TF is it. 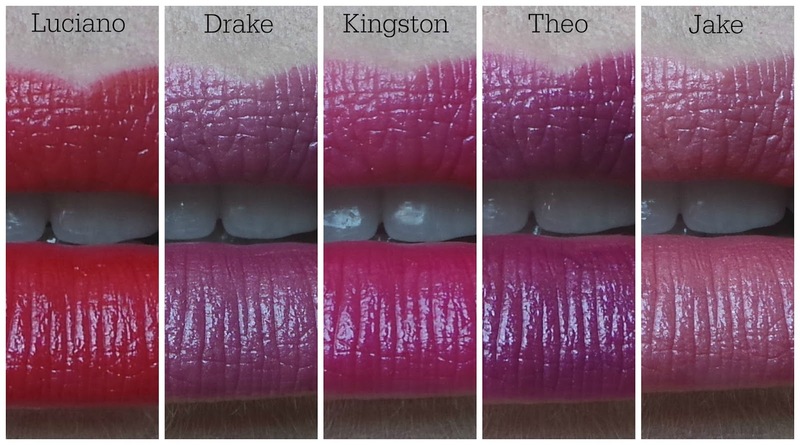 There are swatches of the entire new additions beautifully shot on Michelle's blog and on Linda's blog. Did you pick up any of the Lips and Boys?